I do like the name 'Eden Group' that the translator chose, it's quite cool. However, all of the related equipment is still has the paradise prefix (or P. in shorthand) instead of eden. Additionally, the equipment that is numbered, such as P Dagger I, has the number completely garbled and unreadable. So like, it should be "Eden Boots III" instead of "Paradise Boots %#@^". 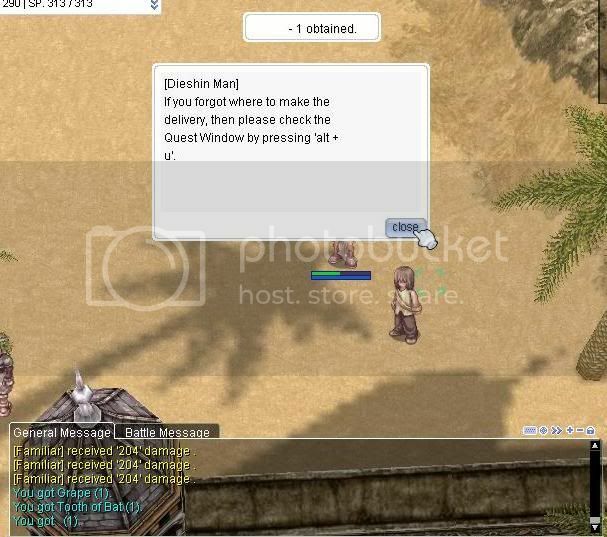 Training course "conquest a desert"
You attend training for novice of paradise team. moroc. you should meet a talking dog in Sogat. Fix the basic errors, make the Summary clearer (one thing that could help is by giving coordinates for the npc). So.. A bunch of us are on map moc_fild11 at the center of the Oasis and there isn't a doggie here. Are we in the wrong place...? Was the dog not implemented? Some of the NPCs also have "Para" in their names still. That should probably be removed or changed. They'll never give exact coordinates in game, we need to "explore"
South, then east of Morroc. It's a little above the body of water. You should see a Desert Wolf you can talk to. Ah, just very bad directions then. Fix to "near to the Oasis" or something please. There were a lot of lost people wandering around that general area. The Paradise Team items will all eventually be named Eden Group. The Novice training ground will be sorted out first and then the Eden Group scripts next. Edited by richard, 12 February 2012 - 06:25 AM. I just did the quest to kill 20 Thief Bug Eggs and collect 10 Chrysalis. I completed it and got my EXP reward but the NPC didn't take the Chrysalis, which I thought was odd. Is this intended? Defeated [The training course 'conquer a desert!' - A real battle1] monster from [Condor] quest. 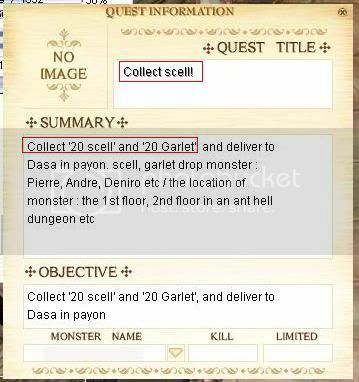 Quest name and monster name should be switched? Not sure if this is true for other quests as well yet, I just noticed this for the first time. EDIT: Appears to be the case for other quests too. To [Condor] use [Cold Bolt] skill. Edited by Ruina, 09 September 2010 - 09:17 PM. wording for when using skills on monsters is odd. 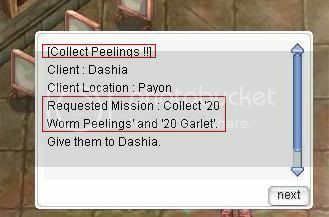 There are some weird dialogs in both training grounds and Eden group. I believe Boya told me to tell the dog she's "really great". What the dog actually take was "Dear Boya was really perfect". Quest [The training course 'conquer a desert!' 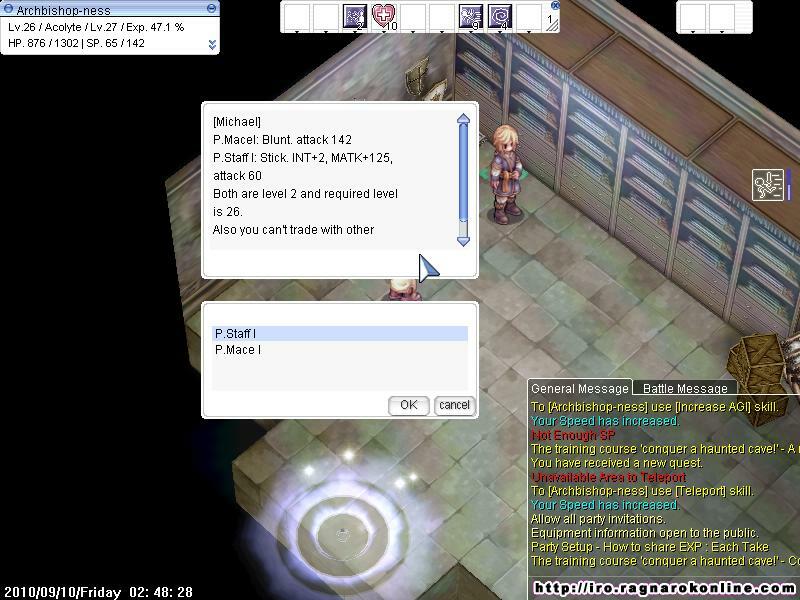 - A real battle1] target monster [Condor] defeated (1/20). Also the quest names of most all the new quests are waaay too long to fit into the quest window. There is an order problem here, the desc's and choices should be given in the same order. Just a weird quest title here. It has zero to do with collecting feathers, all you need to do is hunt Peco Peco. Having issues with this quest. The first line is very vague. In the pyramid? I'm assuming it's the first level of the pyramid, but that map is a huge maze I spent half an hour combing through that map and couldn't find an npc. I looked through the map before the pyramid too and couldn't find him either, but maybe that's because that map is chock full of npcs. Is there a way to cancel Eden quests? If not, I'm kinda stuck with this .__. ^He's not inside the pyramid, but outside. Pretty close to the warp to/from Morroc actually. 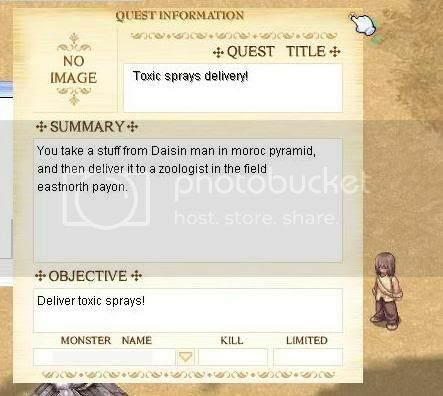 He gave me a blank object, which is supposed to be an insecticide. It's sitting in my Etc tab as an invisible object (but with a 1 next to it, so I know it's there). When I try to right click it to view its info, I get a Gravity error and the client shuts down. 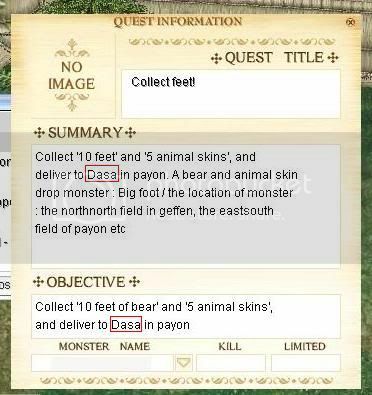 The quest window has eastnorth payon when in fact, the npc is located 1 east and 1 south of Payon (not that a northeast map exists, but still). The Dieshin Man also said east and south of Payon in his dialogue. EDIT: Encountered the same problem with the Deliver a honey! quest. The npc gave me another invisible item, which should be honey in this case. EDIT2: Same thing for Deliver a blanket! quest. Given invisible item should be a blanket. Edited by Ruina, 10 September 2010 - 10:16 PM. When entering Eden and then later exiting, it sends you to Prontera. When I was playing cRO, it would teleport you from the town you teleported in from. Started to do the Training course "conquest a desert" got to the part where he asks you to kill desert wolfs but got disconnected in the middle of killing the desert wolfs. when i logged back in it spawnd me in the paradise building so i went back to the talking dog and it starts his dialog over again and asks me to kill condors again but the quest dosnt apear in quest list anymore so none of the condors i kill register and he just keeps saying go kill condors so i cant finish this quest. I'm concerned that because everyone is doing Helpful Henry's quests, no one will bother doing the Eden quests which is bad considering that they are bugged to hell. I'm worried about that too, so I'm going to still do them, and once doing most of a set, use henry to get to the next set (as was intended by his implementation) to test the rest. An intresting thing I've noticed is i'm only level 48, yet i can see the 55-70 quests, what I have to do and all that, but when I click "accept quest" it says the level is out of range (not the exact message but thats the meaning of it) which is odd, because none of the other quest signposts did that. The rest say you arn't level-suitable when you click on them. Edited by Tirasu, 10 September 2010 - 07:18 PM. On the Lv. 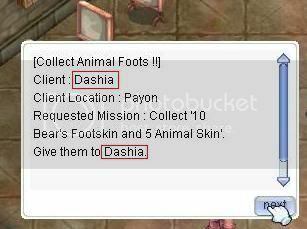 [26~40] Mission Board, the client's name is displayed as Dashia in the Collecting Missions. 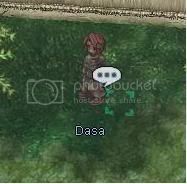 However, the quest window, the sprite itself, and the dialogue with this NPC all display the name Dasa. ^The description in the quest window could use some fixing too. 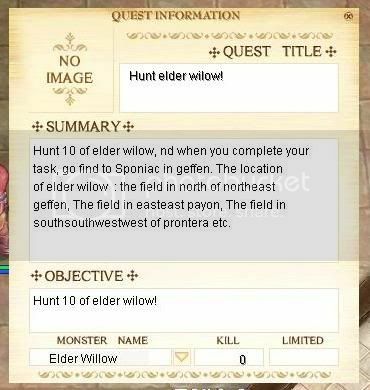 [EDIT]: the Wormtail hunting quest hasn't been removed from the log after I completed it. Is that supposed to happen? Edited by inuko23, 11 September 2010 - 02:25 AM.